Albert Fischer at Tisbury Great Pond. 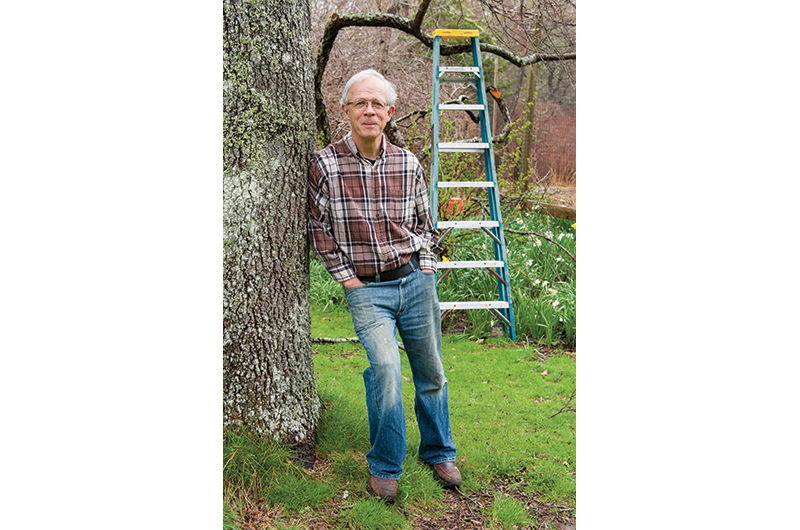 Late one night, late in the 1960s, Albert Fischer heard the cows loudly mooing on the family farm in Chilmark. When he went to the window, he was confronted with a surrealistic tableau: the sky flooded with brilliant light. What had stirred the cows wasn’t a harvest moon or even fireworks. Under the sparkling umbrella of a military flare, the night was blown wide open by a unit of North Vietnamese regulars barreling through the stone walls Fischer and his father Ozzie had so carefully erected. They seemed to be advancing on the house, coming for him and his family. That’s how it went down – at least in his nightmares. For years after he returned from Army service in Vietnam, where he was wounded in battle, cradled one dying comrade in his arms, and saw many others fall, that assault on Beetlebung Corner was among the horrific scenes that haunted his sleep. Vietnam still lives in his memory – sometimes it is summoned, sometimes it comes on its own. Talking about it helps, he believes, but it also tends to set off another round of painful memories – and restless nights. “I’ll dream about it tonight, [after] talking to you,” he said over coffee recently. Fifty years ago, one of America’s bloodiest conflicts grinded away in a distant land, but it also advanced on the Island in unexpected ways, leaving behind a residue that affects the lives of Islanders even today. 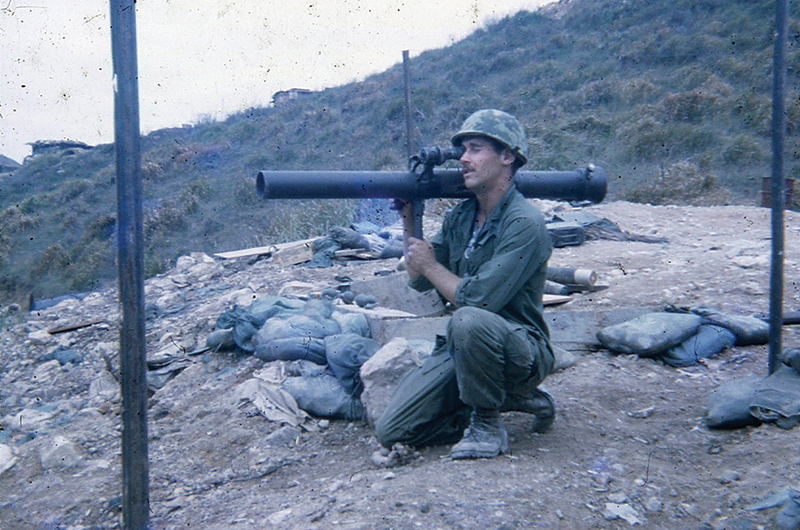 Fischer practicing in Vietnam in 1969 with an M67 recoilless rifle, an effective weapon against machine gun bunkers. The Vineyard changed, too, its easy summer rituals disturbed and its families riven as they saw their finest make a fateful choice: volunteer, get drafted, or avoid military service. Back then, the war over the war played out in many ways, sometimes quite publicly – on the streets, at cocktail parties, on the beaches, golf courses, and tennis courts – and sometimes quietly – in tense conversations at the dinner table, in churches, and at draft board hearings. But it was clear that by the time 1968 rolled around, the Island’s tranquil, backwater quality had already fractured over the war, as evidenced most dramatically by a bitter rift that had unfolded in the pages of the Vineyard Gazette the previous summer. 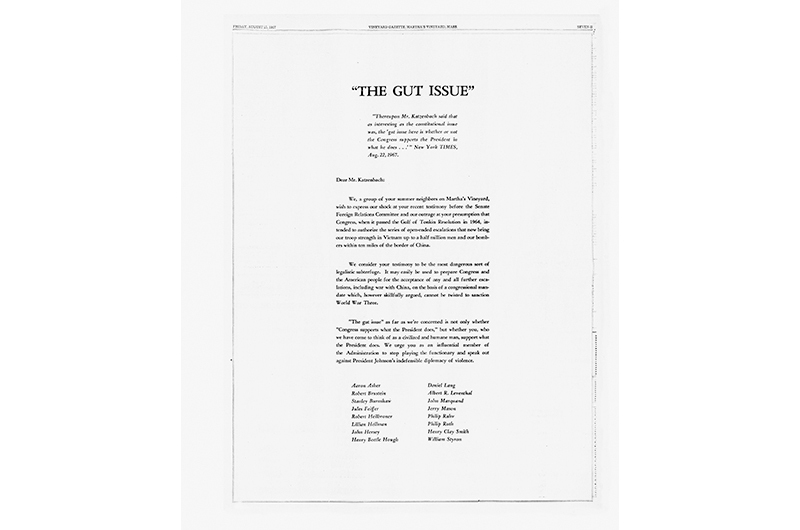 In the August 25, 1967, edition of the Gazette was a full-page ad under the headline “The Gut Issue”. It pitted sixteen signatories, including some of the most prominent literati of the day, against fellow longtime seasonal resident Nicholas deB. Katzenbach, who was then an under secretary of state in Johnson’s administration. Earlier, serving in the Justice Department, he had become a civil rights icon of sorts for helping James Meredith register as the first African-American student at the University of Mississippi, and for staring down Governor George Wallace over the integration of the University of Alabama. Suddenly, the place where people retreat from mainland life and expect to be left alone was no longer a safe refuge. Katzenbach even had his house at Thumb Point on Tisbury Great Pond picketed by protesters, including Rose Styron. Had this signaled the end of the unspoken politesse of the Vineyard? “Oh, absolutely,” Styron said recently. During the height of the summer season in 1967 the Vineyard Gazette published a full-page ad criticizing long-time summer resident Nicholas deB. Katzenbach. For Rose Styron, who had been on Tom Hayden’s arm marching against the war in Washington, D.C., and Brustein, who encountered Black Panthers hell-bent on shutting down his theater in New Haven, Connecticut, this was comparatively mild stuff. Leave it to the inimitable Art Buchwald, a summer resident and friend to some of the signatories, to put it in perspective with a generous dollop of humor. In his syndicated column, he mused whether “people have the right to ruin a man’s vacation by writing an open letter to the local newspaper on the subject that the poor official comes up to Martha’s Vineyard to forget?” One of the lessons, he added, is that Katzenbach should refuse to testify before a Senate committee during the month of August – prime time on the Vineyard. The open letter made news in The New York Times, The Washington Post, Time, and Newsweek. But on the Island? “We, the ad’s organizers, had violated basic Vineyard rules and ethics,” Feiffer wrote in his 2010 memoir. “Our act was nearly as offensive as the war itself.” Hyperbolic? Absolutely. But it spoke to how zealously some summer visitors guarded the Vineyard’s fragile bubble. 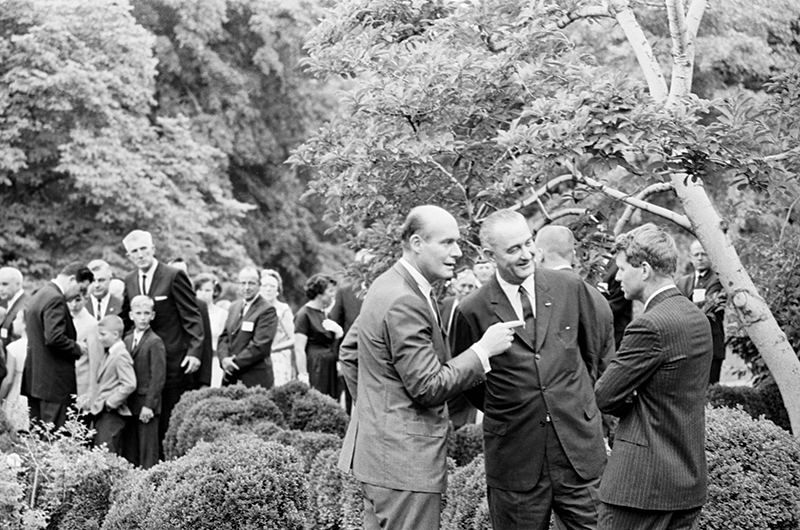 When Robert Kennedy announced his intention to run for president, Katzenbach (left) took over as President Johnson’s attorney general. This ad was sponsored by a group that called itself Martha’s Vineyard Summer Project, which had held lectures and petition drives throughout the season. One particularly ugly incident, at the end of the summer, marked how deep and wide the fracture had become. On the Friday of Labor Day weekend, a group of teenagers heckled two members of the summer project who were gathering signatures on Main Street in Edgartown, according to a Gazette account. The teens also burned some of their literature and physically intimidated one of them, Woollcott Smith of West Tisbury. One of the hecklers later claimed that a police officer “had told him to go ahead and heckle as much as he wanted to, that he was going to look the other way,” Smith told the newspaper. It turns out, the group had been refused a permit from the town selectmen to gather signatures on the sidewalk, so they got permission from landlord Alfred Hall to set up in the alcove of the vacant A&P, the Gazette reported in its September 8 issue. Hall later told the group he had mistakenly given them permission at all. While at home passions had been inflamed, sides chosen, and some feelings bruised, the physical casualties of war had also taken their toll on Island families. Two Island men had lost their lives that year: Marine Corporal Daniel S. Bettencourt of Edgartown, who was killed by a grenade in May; and Army Sergeant William T. Hagerty, of Vineyard Haven, a medical corpsman with the 173rd Airborne who was mortally wounded on Hill 875 in Dak To in November. The bloodiest year of the war was still ahead. As January 1968 rolled around, Renee (Ortiz) Grimmett could barely contain her excitement. The newlywed was about to reunite with her husband. She and Jon L. Grimmett had been married the previous July 1 at St. Augustine Church in Vineyard Haven, and spent less than a month together as a wedded couple before he was deployed to Vietnam with the Army’s 101st Airborne. 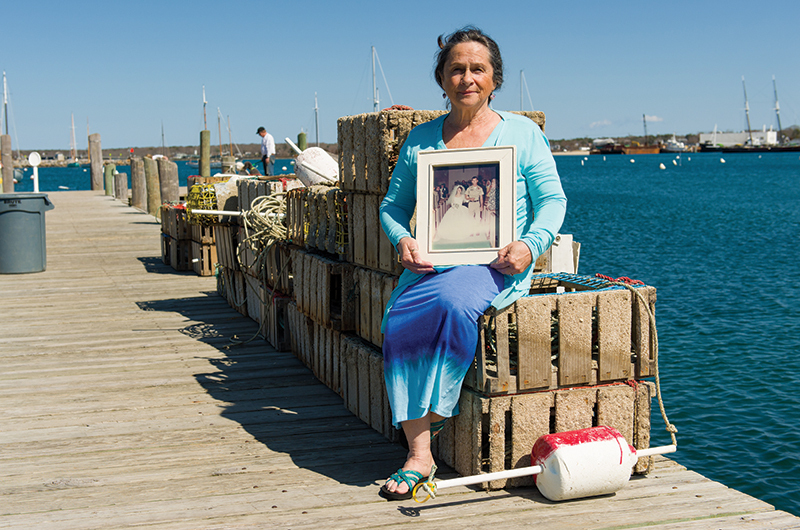 Renee Grimmett’s husband, Jon, was killed in action shortly after their 1967 marriage in Vineyard Haven. Renee had grown up on the Island and met Jon when she was about ten years old – it was hard not to notice him at Owen Park Beach. “He was notorious for pushing me off the end of the pier,” she said, smiling at the memory. He was a summer kid, part of a military family that moved around a lot, but Jon’s mother was a Santos, a family with deep Island roots. When Renee and Jon began dating in 1966, she was a senior in high school and he was about to enter Army boot camp. By the end of that summer, Renee and the tall soldier with piercing blue eyes were engaged. They planned to wait a few years to get married, but in 1967 Jon learned he was headed to Vietnam, so they moved up the wedding. A diminutive woman with long, graying hair, she beamed as she recalled the wedding. It rained the day before and the day after. But for Specialist 4 Jon L. Grimmett, in his dress uniform, and Renee Ella Ortiz, in her flowing bridal gown, July 1 dawned “sunny and bright,” she recalled. A few weeks later, he was off to Vietnam. In January Renee flew to Hong Kong, where Jon’s mother lived at the time – his father was a CIA officer in Vietnam – and they waited together for Jon’s leave to start. But it was not to be. In battles that flared around the country during the run-up to the Tet Offensive, Jon’s unit came under heavy fire in Song Be, north of Saigon, and suffered heavy losses. Jon’s commander asked him to consider staying for one more day – the very day he was supposed to start his leave. “And there was no way he was going to leave when his buddies were under fire,” said Sue Grimmett Martin, Jon’s older sister. He was shot through the chest after leading his unit, capturing two bunkers before getting hit by fire from a third. He had just turned twenty-one and been promoted to platoon sergeant. After his death, he was awarded the Silver Star, and his men nominated him for the Medal of Honor. She was nineteen, angry, depressed, even suicidal. And she had come home to a different Island from the one she thought she knew. Sure, she had seen the usual intra-Island town rivalries, but this was something else entirely. People didn’t know what to do with a young Army widow, especially one widowed by an unpopular war. “I just wanted to get the hell out of here,” Renee said. And she did. By the end of the summer, she got off the Island, and then got out of America, heading to Europe for several months. For Tom Hodgson of West Tisbury, the decision to apply for conscientious objector (C.O.) status seemed to be predetermined by his DNA. His mother was Nancy Weadock Whiting, who served as the town’s tax collector and later its librarian, a signature Island figure in the civil rights movement. She and four other Vineyard women traveled to the South and spent a night in jail after trying to help black people register to vote. Hodgson recalled being in the basement of Grace Episcopal Church in Vineyard Haven when his mother and others founded the Vineyard chapter of the NAACP – the very same day President John F. Kennedy was shot. He had, in other words, grown up in a philosophy of nonviolence, comfortable in a town that seemed proud of its tolerance. Tom Hodgson was an early recipient of non-religious conscientious objector status. In 1968 the Vineyard had about 6,000 full-time residents, about one-third of its present-day population. There were about eighty-three kids who graduated from the high school that spring, the same year that more than 296,000 young Americans were drafted into the military, the second highest number of the Vietnam era. For those drafted and deemed medically and psychologically capable, the choice was to serve, go to college (college deferments ended in 1971), evade the draft, or apply for C.O. status. Nearly 600,000 men illegally evaded the draft during the era – and estimates of those who fled across the border to Canada ranged from 30,000 to 100,000. Another 170,000 were granted C.O. status – which provided a choice of service in the medical corps or two years of community service – more than double the number who sought and gained the status in World War II. Hodgson had graduated from high school in 1966, thought briefly about going to Canada, but decided to try college – Antioch College in Ohio, where his mother and various other relatives had studied. After a year or two, however, he dropped out, immediately exposing himself to the draft. He decided to restart his bid for conscientious objector status, which he’d begun before Antioch. By the time he appeared before the Vineyard draft board, he had compiled a two-inch file full of correspondence, letters of support, and various forms. He had studied and read to prepare for the hearing, where he expected to confront the prevailing stereotype of a draft board – a collection of saber-rattling, jingoistic sorts hell-bent on dispatching America’s finest into harm’s way. “You were taught to expect unreasoning people and hostile people,” he recalled. Instead, what he found were a group of thoughtful Islanders who were puzzled about why he wouldn’t serve in the medical corps (in his mind it was a cog in the war machine) or just join one of the churches generally regarded as “peace churches” – Quakers, for example, with whom he had spent much of his youth and whose members frequently received C.O. status. His circuitous path through the Vietnam years took him back to college in early 1969, and then again into the draft pool, only to be summoned for a physical in Boston. Ultimately, he was declared 4-F – unfit for service – perhaps as the Selective Service’s way of quickly dispatching with a case rather than dealing with a potential C.O. The Vietnam era leaves him thinking aloud about an idea he acknowledged would face gale-force headwinds. Albert Fischer volunteered. As did Daniel Bettencourt. As did William Hagerty. As did Jon Grimmett. It’s noteworthy that despite the attention paid to the draft and the resistance to it, the vast majority of servicemen and women in Vietnam and elsewhere during the era were volunteers. There were a variety of reasons, among them patriotism, the chance to acquire skills, or even opportunity, especially for families that could not afford college. By August 1969, Fischer was in Vietnam, an experience he described as boring, frenetic, gruesome, random, and surreal. He would take in a hillside with fragrant flowers on a glorious day under beautiful blue skies, only to witness one of his buddies blown up by a previously undetonated B-52 bomb. On another day, a friend was similarly killed – one who carried a Bible wherever he went, reading from it whenever he could. “That’s when I kind of lost my religion,” Fischer said. On November 9, 1969, at midnight of the darkest of nights, mortar rounds rained down on his unit. As he reached for his helmet, he felt a blow that rattled him so profoundly he began seeing the mental images of a man whose life was about to end. “It felt like someone had taken a Louisville Slugger baseball bat to the back of my head. I saw my parents, I saw my grandmother, waving goodbye. It was that clear.” With a piece of shrapnel lodged in the back of his head, he got medevac’d out, holding a mortally wounded private who had arrived in Vietnam too green, too scared, too young. 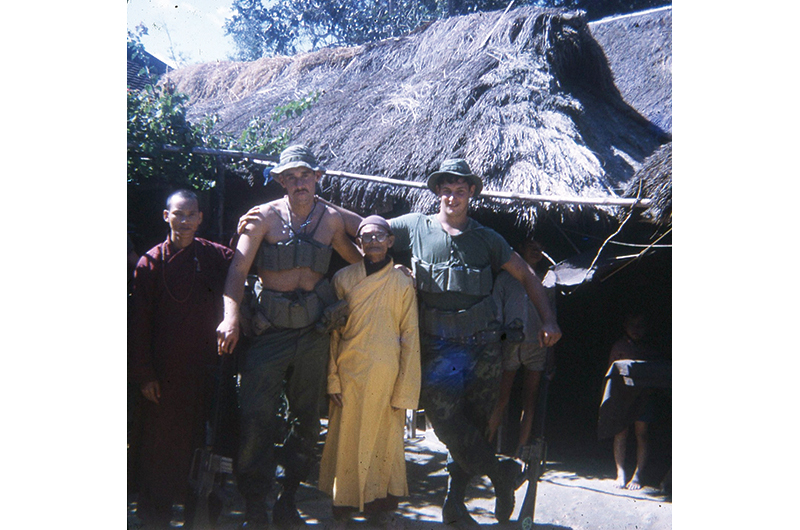 When Fischer came home, almost a year to the day after he went to Vietnam, he had changed. So had America. And so had the Island. Fischer (second from left) still has occasional nightmares about the war. It’s a common story told over and over again by servicemen during those years. No brass bands awaiting most of them; on the contrary, they were targets for people fed up with an increasingly unpopular war. “A lot of guys, when they got to the airport, they would take off their dress uniforms,” said Tom Bennett, an Army medic who graduated from high school in 1964 and enlisted the following year. “There was dead silence. You could hear forks falling on the plates. I was fearful of what I had the potential of doing to this guy. ’Cause all I could think about was my friends who died. He wasn’t insulting me – he was insulting my friends who didn’t make it.” He just got up and left. “America learned through us how wrong that was,” said Fischer. At the end of the decade, a general sense of exhaustion seemed to set in – over the war, the domestic strife, and cultural upheaval. The principal of the high school, Charles A. Davis, made note of the passing decade during his annual report in December 1969. What he didn’t mention was the war, which would run several more years and claim another 10,000 American lives. Among them was Islander Lieutenant John R. Painter Jr., a Navy pilot who was killed flying over the Gulf of Tonkin in 1971. Today, all around the Island there are reminders of those who served in Vietnam and came home and those who weren’t so lucky. Drive out to Franklin Street in Vineyard Haven to West Chop and you’ll see two streets on the left, in succession – first Grimmett Way and then Wm. T. Hagerty Drive. Or there are plaques, flags, or other memorials to veterans in all the towns – for example, on Main Street in front of the courthouse in Edgartown, in the Oak Grove Cemetery in Vineyard Haven, and in front of Chilmark town hall, right across from the Fischer family farm. Fischer considers himself one of the lucky ones who had a support system to help him through rough times. An imposing but gentle man with a dry wit, he makes a point of saying he does not use his military service as a crutch – rather it seems to fortify him to remember what he endured. Renee still lives on the Island where she grew up and met Jon Grimmett as a child, became his young bride years later, and lost him soon after. She has endured love and great loss since – another marriage and divorce, and the deaths of two of her four grown children within five months of each other – Bethany, at thirty-four, just days after giving birth to twins, and Naylee, thirty-eight, after a two-year struggle with cancer. Renee nonetheless draws strength from her religion, what she describes as her spiritual connection to Jesus Christ that was forged a few years after Jon’s death. Though their time together was short, no matter. This is such a great article and brings back very vivid memories. I apologize to any and all Vietnam Veterans who were disrespected and dishonored when they came home and in the years afterward. It’s an embarrassment to know those things took place in my generation. These were my friends who went to Vietnam whether voluntarily or through the draft and they served our country ! Thank you to them all. Thank you for such a well done article of such a difficult time for many. What a well rounded perspective on turbulent times that shaped us all today ! As a person with a fondness for history, especially war time history; and as a seasonal resident of MV, I loved this article. I thank and appreciate all our Vererans have done for us. And as a “hero’s welcome” was not available to the degree it should have been, your heroism is enforced each day as our nation heals and learns from this experience. Thankyou for a beautifully written, deeply researched and wonderfully human article. Thank you for this excellent article on a subject that brings about strong memories for anyone who lived through the Vietnam era. You captured both sides with kind eloquence. I think those who serve may hate war more than anyone else. As a country, we learned how to treat with dignity the men and women who return from war, and, I hope, those who chose to stay home. Our veterans from Vietnam and earlier are getting old and passing on. As the Chaplain of American Legion Post 257 (Vineyard Haven), I have the unique privilege of presiding over military honors for nearly all veterans buried on the island. We salute our fallen comrades, proudly remembering their service while praying for peace.